Sunday is World Day of Remembrance. Will you join the Massachusetts Vision Zero Coalition in honoring victims of traffic crashes? Sunday, Nov. 18 // 2:00 – 3:30 p.m. 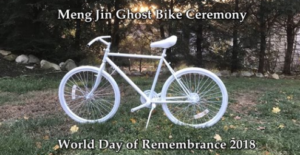 The day will begin with a ghost bike ceremony at 12:30 pm, followed by a vigil and silent march from the State House to City Hall to demand swifter action to prevent traffic deaths. We know you are angry and sad about recent fatalities on our streets. So are we. These kinds of tragedies are avoidable with better, proactive planning and policy. Stand with us to show that life-saving infrastructure improvements cannot wait. Sunday, Nov 18 // 12:30 – 1:30 p.m.
On Sunday, members of the Coalition will be placing silhouettes at crash sites throughout the Boston area, as well as statewide, as part of the #CrashNotAccident awareness campaign. Crashes are not accidents — they’re the tragic, preventable results of inadequate planning and policy. People make mistakes; our streets must be designed so those mistakes are not fatal. Please join us to ensure that these lives are not forgotten and to demand safe streets for all in our communities. 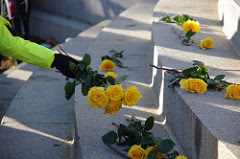 Please dress warmly and wear yellow in remembrance of those we’ve lost to traffic crashes. We also encourage you to invite your elected state and local representatives. Show them the human toll of dangerous street design and urge them to support Vision Zero. You can find your city legislators here, and your state legislators here. The vast majority of these traffic crashes are preventable through engineering, education and enforcement. In numbers, we can recognize our loved ones, and also demand action from our elected officials. We hope to see you there on Sunday, November 18th.